I could be forgiven for a sense of Déjà vu as I drove to Sixmilebridge for the second weekend in a row to photograph a Crowe bride, a shopkeeper’s daughter, on a cold morning in February, except that this was a different branch of the Crowe family – Zoe, who married James yesterday, is a first cousin of Bernadette who married Michael last weekend – and the wedding was at a different church – the quaint St. Mary’s Church in Kilmurry, a couple of minutes drive from Sixmilebridge – and the reception was at a different location – the Falls Hotel & Spa​ in Ennistymon. This wedding ticked a lot of boxes for me, and rewarded me with lots of great photo opportunities. Topping the list of boxes ticked was the most beautiful light I’ve photographed in quite a while. In particular, the light during the morning preparations in the centuries-old family home, next door to the family shop, quite literally at the heart of town, was simply amazing. 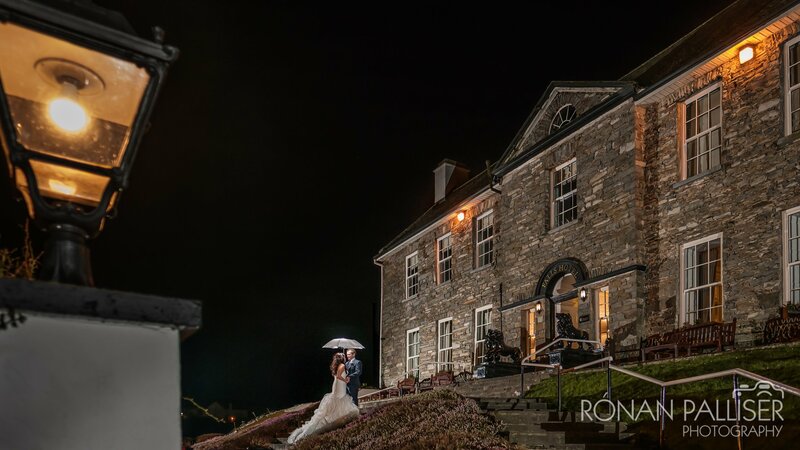 Other boxes ticked included the style of the brides and the bridesmaids, the easygoing nature of the bridal party in general, the dry weather, the brief stop off at Knappogue Castle, and the hotel being a new destination for me – much as it’s nice to get back to familiar venues, there’s a creative kick from discovering a new venue for the first time. Once Zoe had put the dress on as childhood teddybears looked on from above the wardrobes, I scooted ahead to the church to catch up with James and his groomsmen ahead of Fr. Harry Bohan’s ceremony. The beautiful light continued through the ceremony, shining a dramatic shaft of light on the bride during the vows and exchange of rings. From there, via a quick family photo session at the church after it had emptied, we stopped off briefly at Knappogue Castle where we braved the cold (and yes, it was cold!) for a quick bridal party photo session before heading on to the hotel. Thanks to things running nice and early, there was plenty of time for mingling before the call for dinner, at which point I set up what the bridesmaids were calling the Kate Middleton royal family photo as orders were taken in the function room. Speeches were before the meal, so afterwards I had plenty of time to setup a night time shot outside the front of the hotel – three lights, and a carefully chosen composition that avoided the car that, unfortunately, parked in the worst possible spot between me setting up the shot and asking the bride and groom if they wanted to pop out for a photo! You win some you lose some. I lost the battle with the car, but hopefully won the war with the resulting photo. My coverage finished with the start of dancing, the puntastically-named Phil ‘N The Blanks​ got the party started after father of the bride John serenaded his daughter following Ellie Goulding’s first dance. As I hit the road the party was well underway, and no doubt there was a sing song going by the time I got back home in the early hours, another enjoyable Sixmilebridge wedding under my belt! PS: Lovely to work alongside Declan from S.E.S Digital Video​ once again.